Understanding your buyer better is one of the “secrets” to making the sale. As human beings we are biased, imperfect and largely driven by emotion rather than logic. This FREE pdf sheds some light on the many factors at play that can help you make or lose the sale. Selling is about good communication and finding a connection, not techniques and trickery. 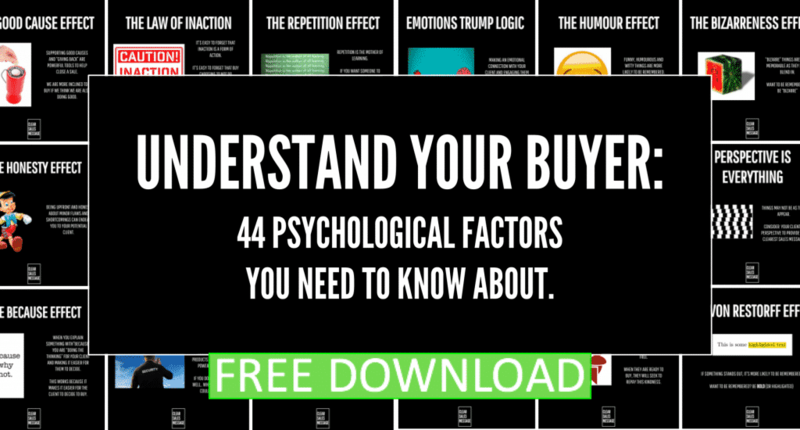 Utilising elements of psychology, science, common sense and the Clear Sales Message philosophy, this guide is designed to improve your communication and drive your client engagement right now. For free. of selling to them, then this is for you. No spam. No sales pitches. Just great, value focussed content to help you develop a Clear Sales Message.